The Prazsky Krysarik is said to be the smallest breed in the world. The chest is broad but not at all deep and is descending only partly to the elbows. It has a lean, delicate body, which is covered with thin skin. The nick is moderately long and narrow, supporting its delicate head. The muzzles narrow and fox-like, with straight but crowded teeth. Its coat is short with very thing glossy fur. Coat color is mostly black and tan. 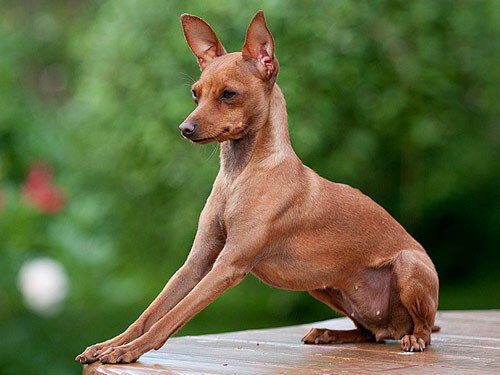 He is 2 cm shorter in maximum height than the Miniature Pinscher in minimum height. Miniature, very quick, active, alert and lively. This breed shows love for his master and is very watchful. The Prazsky Krysarik has a highly developed sense of smell. Because of his small size and briskness he was used for killing rats (Krysa), (it gave him the name "Krysarik"). These qualities in which he possesses have been developed over the past centuries. He is very social, obedient, and warm-hearted. He gets along well with children. By nature he is noble and intelligent. Do not allow this dog to develop Small Dog Syndrome, human induced behaviors where the dog believes he is pack leader over humans. This can cause varying degrees of behavior issues. Proper canine to human communication is very important. Although it is tempting to carry these dainty creatures about; these are active little dogs, who need a daily walk. While out on the walk the dog must be made to heel beside or behind the person holding the lead, as instinct tells a dog the leader leads the way, and that leader needs to be the human. Play will take care of a lot of their exercise needs, however, as with all breeds, play will not fulfill their primal instinct to walk. Dogs who do not get to go on daily walks are more likely to display a wide array of behavior problems. They will also enjoy a good romp in a safe open area off lead, such as a large fenced in yard. Don't think that just because he is small he should be confined to a small space.